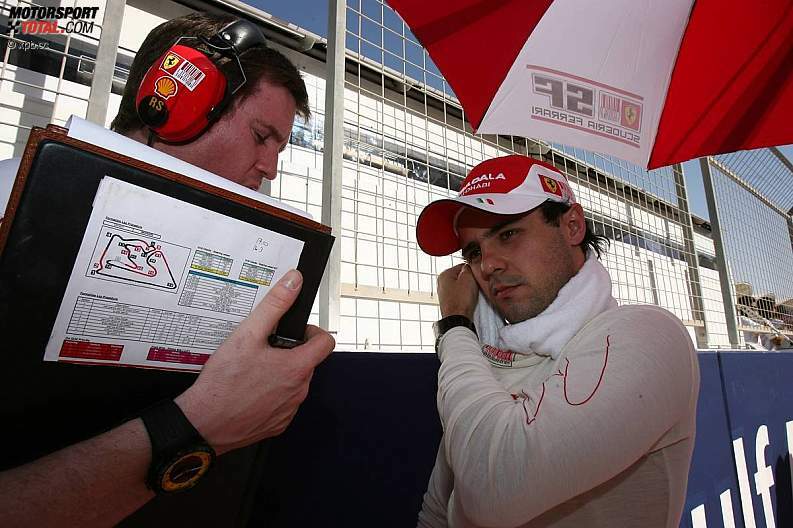 Felipe Massa will be joined by Fernando Alonso at Ferrari this season. The Brazilian vice champion of 2008 is ready for a fresh start following his heavy crash in Hungary last year. He is now the father of a healthy son and is hoping to gift his son with many victories. I've seen some good signals. We were the team with the most laps and the lap times were good. Did you check out the competition? Sure! We're always watching the others, not just the final time, but also race simulation: for example Red Bull went out with tyre x and did this run, the tyre y and did that. The result is the there are many competitive teams: Red Bull, McLaren, Mercedes, maybe Williams. And we are in there for sure. Your friend Schumacher said that he can't win Bahrein, but then corrects himself. What do you think? He's strong he can win. But we too. If I was 41 years old I would be too, but I'm 28 and I'm happy with testing. Is there something on other cars you would like to have on yours? There are many details, but if I don't know the data from the wind tunnel I can't comment. Mercedes has a different nose, looking nice, the McLaren is strange... In the end it's important that it works . The new teams are having problems: also on the track? I hope they won't be a danger. There are 6-7 teams one second apart while those teams are 4 seconds behind. It's not good for the sport and not good for them: it's like two different series. They'll suffer. And we'll suffer too, when we have them in front of us during qualifying. Qualifying will be more important now? Is it true that you can't overtake anymore? No, not much will change. If you're driving a car with all that petrol on board it will be harder on the tyres and the possibility of making mistakes is higher: and the one behind you will benefit. Managing the tyres will be the technical key to the season? It depends on the circuit: on some the wear is higher and changing the tyres can be important. Consumption: what can the driver do? There are things we can do to consume more or less fuel. If there are for example 15 laps left and you have more petrol on board than you need because there was traffic, there is a way to burn more. You are a veteran of the team. Time goes by: as a veteran how much do you feel the team's wish to win? You can't go wrong. It's a very important moment for us after a horrible year and difficult due to politics. We really want a good Championship. It was also a difficult moment for me with the accident. I'm concentrated, I'm ready 100%. Don't you think that if one race goes wrong they'll say that you're not the old Felipe? Someone might say that. I'm expecting that and I'm not worried. Not worried at all. What has changed with Fernando Alonso? We're talking Italian. We also argued in Italian!. We've got many things in common, the way of life, the mentality. That's also good for the team, which has the same mentality. Did you see all the fans at the tests in Spain? Are they more passionate than in Brazil? It was wonderful. But I'm sure that of there was a test in Italy, or in Brazil, and the price was right, there would be as many people. After three months what does it mean to you being a father? It's fantastic. I'm in love with Felipinho, every day my wife sends me photos of him via cell phone, her is today's! He's great, he looks at me and he smiles. He's got a good character and he let's me know what he wants. He's determined. And he has more hair than me. I have to work more. I have a son to feed now. But when I'm in the car I don't think: I won't go slower. Sunday in Bahrein: will you be happy only if you win or considering how it went at the last race in 2009 it will be enough if you're close to the others? Well done Massa. I was thinking if it would be a walkover by Alonso, but that was a good job during Q3. Hope he can maintain his position during the race tommorow. Schumacat a écrit: Well done Massa. I was thinking if it would be a walkover by Alonso, but that was a good job during Q3. Hope he can maintain his position during the race tommorow. I think Bahrain is one of Massa's favourite tracks and Alonso looked really good here. So I think Massa is going to have a really tough time this season, but I hope he can compete with Alonso. Alonso is looking really ominous in that Ferrari. Alonso started better than Massa and he basically won the race there. Well done for him. But im still not preoccupied. They seem to have similar performances. At the late stage of the race there was a larger gap in lap times there, but i think Massa could have had some problem by the way his engineer was behaving, other than the fact that Ferrari wouldnt let Massa and Alonso fight, so there was no point in Massa pushing and maybe he was saving his engine. Regardless, Alonso certainly is gonna be a lot tougher to beat than Kimi. normally Massa qualifying is good which will be his advantage over Alonso. But Alonso starting is a lot better than Kimi. So it will be tough for Massa to beat Alonso. In terms of speed i think they are about the same. come on! it could be worse considering he has an engine problem but he finished second which is good. I just hope he doesnt put too much pressure on himself because of Alonso. for him to finish 2nd is super, considering what happen to him. I am expecting (read hoping) a closer fight with alonso soon. RED DEVIL FAN a écrit: come on! it could be worse considering he has an engine problem but he finished second which is good. I just hope he doesnt put too much pressure on himself because of Alonso. You´re right. I didnt knew about this before. His engine was overheating and consuming too much fuel, so he had to slow down. Right before that he was actually closing the gap on Alonso. But i think it would be impossible to overtake, and Ferrari wouldnt allow them to fight and risk a 1-2 (rightly so). Im still feeling confident. It was a really hard race, and with the problems Massa has had all weekend, its much much better than i expected...and he beat Alonso and kepy his 2nd place in the WDC. Malaysia should be better in terms of pace..but i hope Ferrari dont over heat. We have seen Fellipe come back from terrible season start twice before......now what happens when his season start is OK!! Go Felipe, keep racing like today ( and Fonzi behind you;) )! Rus-Evo a écrit: We have seen Fellipe come back from terrible season start twice before......now what happens when his season start is OK!! Lil Felipe baby wants to be tall.... ...sweet! LadyR a écrit: Go Felipe, keep racing like today ( and Fonzi behind you;) )! And we´re leading the WDC. Nice. yea....even though he is leading he WDC..he is still average is some peoples eyes. Even if he won all the races..he would still be average. Brilliant job...and lets keep this position. Its still early and it doesn't mean a lot really..